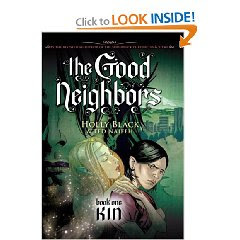 I really enjoy Holly Black's writing style and this one didn't disappoint. This is the first graphic novel I have read and it was nice for a change. It did take me longer to read than I would have thought since I was looking at the detail in the pictures. I guess a picture is worth a thousand words. This was a good choice for my first book of this type. I can't wait for the next one. It sounds really good, I wish it wasn't a graphic novel, I don't know but I still have some aversion to these. I'll have to overcome that some day soon.